Normally, my blogs start here and go to Twitter and Facebook, but this is something I wrote on Facebook this morning that I think might be worth preserving as a blog here. Putting it here also gives me a good excuse to expand and elaborate a little more. This is a another project in which I have a minimal involvement, but can actually claim that it wouldn’t have happened if not for me. Ok, secret history time. Things actually start with Rick Loomis. In 1975, Rick was running a play-by-mail game called Starweb, and he published an irregular newsletter for it called SuperNova. I became his editor for SuperNova. At about that time Dragon Magazine was taking off and doing great things and I began telling Rick we should do something similar to promote Tunnels and Trolls. 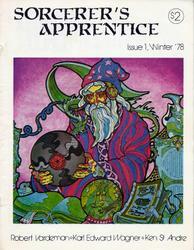 I was already running the occasional sf cartoon in Supernova, so when I convinced him to make the jump to a better format we started a new magazine called Sorcerer’s Apprentice, of which, I was the first editor. I wanted some cartoons for SA, and my two dependable artists at the time were Liz Danforth and Steve Crompton. So, I asked Liz for a cartoon, and she did the first Grimtooth cartoon featuring a troll. From all that sprang the Grimtooth’s trap books. Most of the traps were created by Flying Buffalo (i.e. Rick Loomis’s employees). I wasn’t on salary, but was part of the crew, and I had a few simple traps of my own in the first book, and maybe some of the others–it was a million years ago, and I don’t remember. Decades later, this project appears, and I have a couple new traps in it too, and I signed a special autograph page to be inserted. Now, I didn’t invent Grimtooth, and I didn’t create the Traps books, and most of the creation/work was done by other people, but . . . none of it happens if I don’t do Tunnels and Trolls and get involved with Rick Loomis publishing my game, and making me editor of SA. Liz Danforth came to work for Flying Buffalo because she and I met at the Phoenix Friday night science-fiction fans gatherings, which I helped Terry Ballard start back around 1970. When T & T needed to go into a second edition for its first publication by Flying Buffalo, I got Liz to do the art for it, and from those first fantasy pictures, she soon became the main artist for Flying Buffalo. And on and on. Everything is connected. So watch this, and support the project if you like the idea. https://www.kickstarter.com/projects/1409961192/. I’m thinking you can really blame this all on Rick Loomis, as he is even more seminal than I am, but still, tooting my own horn for the sake of history, none of this happens without me–a claim that several other people including Rick Loomis, Liz Danforth, Joseph Goodman, and most especially STEVE CROMPTON. If you ever used one of Grimtooth’s Traps, or if you ever contributed one to the 505 traps collected in this new release, why not leave a comment? 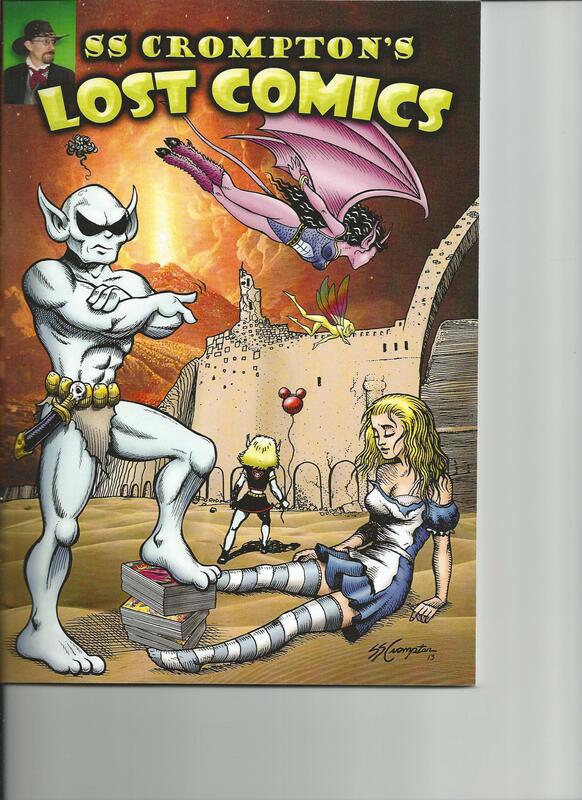 Grimtooth the Troll is having stern words with Alice Liddel while Demin the Domness flies by. Among other things Steve is the prolific artist/writer of Demi the Demoness and the creator of Grimtooth the troll, who is a sort of mascot for Flying Buffalo and my Tunnels and Trolls game. Recently he found some art of his that had never been published, or wasn’t seen much, and decided to bring it out as a book using drivethrurpg.com as his publisher. He finished the unfinished parts. edited, and published it. In the past there was not sufficient justification for releasing this material, but now that print-on-demand is here, and anyone can self publish through sites like drivethru, Steve can offer his material to the world at last. If only ten people see it and buy it, that’s still 10 more than would have seen it before. I have to say I was so pleased and honored to be given a copy that I bought him breakfast, so in a way, I bought his comic after all. 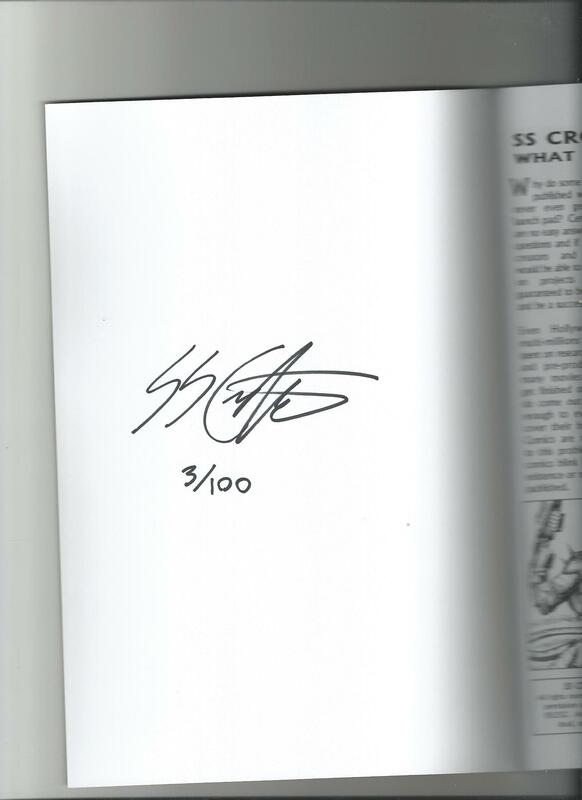 Looking inside, I see that this is number 3 of 100 that he had printed, and that I have his autograph. I usually get a slightly fancier autograph than this. Once upon a time we would try for an author’s autograph as a way of proving that we met the person, or of adding value to our purchase. It’s a form of Magick. The Law of Contagion states that things that were once connected are always connected, so if you have something that is signed by the creator, then you have a personal connection to that creator. However, I have come to believe that autographs serve a different purpose now. In this age of personal publishing, when most of us creators are very small fish in a big ocean of creativity, asking for and obtaining an autograph is a way for we consumers to acknowledge and thank the signer for the work they did in creating this work of art. It’s a way for us to personally recognize and tell the creator that we are glad to have met him/her and we really appreciate the effort they made to create the book/art/object, and that it will be one of our treasures. Having a Ken St. Andre, or a Steven S . Crompton, or a Roger Zelazny, or a Michael A. Stackpole autograph isn’t going to make this book/object particularly valuable. The whole idea that putting someone’s name on something increases the value is kind of stupid, really. We’re all of us human beings, and we all have equal value in the eyes of God and the Law. But, the autograph is another kind of memorial–it is a record of personal contact between signer and receiver–a moment of good feeling between the two people–one that should make both of them feel better. So, I have made efforts for years to get things signed when i buy them. 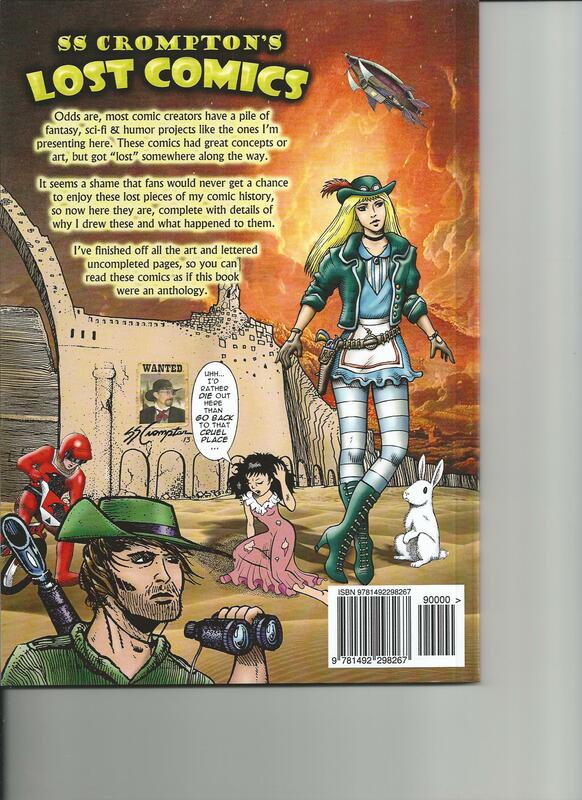 I would keep the autographed stuff to the very end, because those books, pictures, comics, games, and so forth mark some of the high points in my life–a time when I was able to connect with a creator and tell her/him that I think they’re special. This blog is dedicated to my very good friend, Steven S . Crompton. I appreciate what he has given me and the world, and I want to testify that he’s a special guy. If you’ve ever collected autographs, or have any kind of special feeling about them, why not leave a comment?